For 333 years the Spanish had imposed its rule on the the diverse people of the Philippines. To help suppress the risk of armed rebellion the Spanish banned the carrying of bladed weapons, which the people of the Philippines were renown for. As a consequence these art forms became veiled and the outlawed blade was replaced by the innocuous stick. For generations the arts adapted and were transmitted in secret from master to student. 1896 saw the rise of an American backed rebellion that established the government of the First Philippine Republic which battled against the colonial Spanish powers. Faced with conflicts across the globe, the Spanish ceded authority over the Philippines, amongst other territories, to the Americans in the 1898 Treaty of Paris, ending the Spanish American War. With the Spanish gone the masters of the Philippines were once again free to practice their arts in public though the majority chose to remain hidden from view. The Americans immediately installed their own military government in the Philippines, despite their backing of the fledgling Filipino government. Feeling betrayed, the government of the First Philippine Republic declared war on their former allies on June 22, 1899. After several years of heavy fighting that saw the death of an estimated quarter million people, 200,000 of which were civilians, the Americans captured Philippine president Emilio Aguinaldo who urged his compatriots to lay down their arms. Declaring the conflict over in 1902 the Americans installed a civilian government which was replaced by the Philippine Assembly in 1907 which had both elected and American appointed members. However, sporadic insurgencies sprung up from time to time until 1913, especially in the south. The Philippines have always been culturally rich and diverse but the geopolitics of the late 19th and early 20th century had transformed the archipelago into an international melting pot that heightened the tensions of the old and the new, the rich and the poor, the urban and the rural, the local and the global. Ciudad de Cebu embodied this tension. It was was populated by an elite Spanish speaking upper class comprised of Europeans, Americans, Chinese and mestizo Filipinos. They were one of the last vestiges of the Spanish occupation. In contrast, the nearby suburb of San Nicolas was composed of local Cebuanos and immigrants from neighboring towns or other islands in the Visayas. These people were the working class: farmers, carpenters, fishermen, peasants, cargadors and the servants for the City of Cebu’s upper class. They were more receptive to the new culture and language brought by Americans as they had increasing economic ties. This was the setting in which Venancio "Anciong" Bacon was born into in Carcar Cebu on October 15, 1912. Turmoil, rebellion, tension, cataclysmic change. It is also the atmosphere that forged Bacon into one of the most important and influential escrimadors in history through the development and testing of his own personal style of escrima which we now call Balintawak. On August 14th 1920, Lorenzo “Ensong” Saavedra, became a founding member of the first official escrima organization in the Philippines, the Labangon Fencing Club. The school was located in San Nicolas Town, a suburb on the southwest outskirts of Cebu City which has long since been absorbed as a district into the expanding city. It was here in the 1920's that Bacon began training in escrima under the tutelage of Saavedra, the only teacher he would ever have. Saavedra was a master of several styles of escrima but favored one known as the Corto Linear (Short Line). During his time with Saavedra, Bacon became steeped in the Corto Linear style while also studying boxing, Dumog (Filippino grappling) and Jiu Jitsu. In addition to gaining these skills bacon also gained a close friend in Teodoro “Doring” Saavedra, his teacher's nephew. As Saavedra's best students, Anciong and Doring pushed each other, constantly increasing the level of their escrima. As their skill increased so did the number of challenges that were laid at their feet. In 1931 the Labangon Fencing Club disbanded but it had formed the relationships that would define the future of escrima. That future began on January 11th, 1932 when Lorenzo Saaverda and his 2 nephews joined with 9 members of the Canete family to form the Doces Pares, a reference to the 12 legendary knights of the Holy Roman Emperor Charlemagne meaning "twelve pairs". Each eskrimador was a master of a particular style or weapon with the intent of the association being to trade techniques and ideas and promote the art of Eskrima. Shortly after its founding, an additional 12 masters joined the group, including Venancio Bacon. Under the guidance of Lorenzo Saavedra, with Teodoro Saavedra as it's champion eskrimador, Doces Pares quickly became synonymous with the art of Eskrima, establishing itself as the premier group of eskrimadors to be found anywhere. Here Bacon taught and continued to develop his style while responding to any challenges as a representing eskrimador of the Doce Pares. Bacon's style was a direct reflection of his training but also his stature. At 5' 2" and 120 pounds he was not a man who relied on strength or size to overwhelm his opponents. The Corto Linear style that he learned from Lorenzo Saavedra suited him well, allowing him to close the distance and work on the inside of his opponent's range. In numerous matches Bacon became known for his speed, precision, and ability to off balance his opponents, making it difficult to attack him. In a match he would flow smoothly, striking a vital target and moving onto the next before his opponent had a chance to react. However, perhaps Bacon's greatest trait was his desire to improve and his ability to learn from these matches to refine his art, stripping away anything that did not prove its worth in combat. Bacon was also known for his tough training methods, a reflection of his desire to make sure that he and his students were prepared for the brutality of combat with which he was so familiar. World War 2 came to the Philippines in 1942 when Japan invaded and over ran the American and Filipino forces, leaving the remaining soldiers to flee into the mountains to fight as guerrillas. Many of the Doce Pares members joined the resistance forces and also fought as guerrillas to defend their homeland, including Bacon's close friend and training partner, Teodoro "Doring" Saavedra. However, the conflict took a great toll on the Doce Pares as many practitioners lost their lives in defense of their homeland, including Teodoro Saavedra who was captured and executed by the Japanese in 1943. Additionally, Lorenzo Saavedra died in 1945 at the age of 93, leaving the Doce Pares without the influence of the Saavedra family. After the war ended in 1945 the Doce Pares resumed their regular activities. Venancio Bacon continued with the group for several more years but rivalries amongst the students over who's master was the superior eskrimador, including a rivalry between the students of Bacon and Ciriaco Canete, began to plague the group. Having grown weary of the internal politics, and without the presence of the Saavedras, Bacon felt free to leave the group, which he did in 1952. It was in the backyard of a watch shop on a small side street in Colon, owned by one of his students, Eduardo Baculi, in 1952 that Bacon formed a new club with other disaffected members of the Doce Pares including Vincente “Insing” Atillo, Delfin Lopez, Jesus Cui, Timoteo “Timor” Maranga, Lorenzo Gonzales, Isidro Bardilas, and Andres Olaibar amongst others. The group took their name from that small side street, which was named for a successful revolt in the Manilla region against the Spanish in 1896 which had become a kind of battle cry for the Filippino people: "BALINTAWAK" SELF DEFENSE CLUB. After the turmoil that had plagued the Philippines over the previous fifty years, the relative peace and prosperity of the following twenty years, the 1950's and 1960's allowed Eskrima to flourish in what is frequently referred to as "the Golden Age of Eskrima". Eskrimadors honed their skills through frequent challenges, known as "juego todo", usually made between the Doce Pares and the Balintawak factions. Some of these matches were sanctioned and recorded by the government while others were intense battles of life and death away from viewing eyes. Many of these matches ended in crippling injuries and occasionally in death. It was toward the end of this period when Venancio Bacon was attacked one night while walking back to his home in Labangon. Allegedly snapping the spine of his assailant, he was sentenced to a prison in Manilla as the government was trying to crack down on violence, arguing that Bacon should have used his considerable skill to disable his opponent but not kill him. While Bacon was incarcerated the Balintawak Self Defense Club continued under the guidance of Jose Villasin and Teofilo Velez. Bacon was paroled from prison in 1971 and returned to Cebu to check up on his students. He would often sit in on classes and guide from the side, making sure that the next generation of Balintawak eskrimadors were up to his standards but he did not return to full fledged teaching. In 1975 the Balintawak camp began its split into five distinct groups: "Original Balintawak" led by Bacon, "Balintawak International" led by Jose Villasin, "Teovel’s Balintawak Arnis Club" led by Teofilo Velez, "Santo Nino Self Defense Club 19" led by Timoteo Maranga later known as "Tres Personas Arnis de Mano". Ising Atillo started "New Arnis Confederation of Visayas and Mindanao", which later changed it's name to "Philippine Arnis Confederation" and once more to "World Balintawak Arnis-Eskrima Association". All of which still exist in some form today. Venancio Bacon died in 1981 at the age of 69. Not only had he seen the world drastically reshaped in his lifetime but he had also reshaped it with his desire and drive to master his art and share it with others. Balintawak is the legacy of Venancio Bacon and as practitioners of this art we are examples of the way in which his contributions continues to shape the world. As time moves on and the previous generation slowly gives way to the next one, many escrimadors have tried to directly connect their art to Great Grandmaster Bacon. 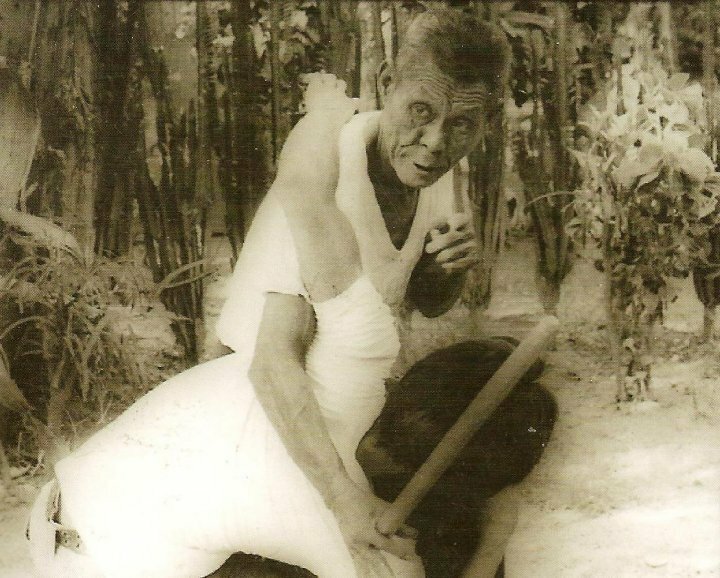 Grandmaster Sam Buot is acknowledged as the foremost authority of the history of Balintawak drawing his knowledge from research and more importantly as an eye witness to the history. As far as GM Buot is aware, the remaining original students of the later generation of Bacon's students includes Arturo Sanchez, Dr. Abraham “Abe” Cerna, Jody Lopez, Octavius "Jim Boy” Hife, Johnny Chiuten, GM Bobby Tabimina, Roman Encarnacion and Sam Buot, though he acknowledges that "many more came at various times in these masters’ lifetime and career. No offense and disrespect is meant for the omission of many. GM Buot continues the lineage of Balintawak through the students of Velez and Villasin including the Velez brothers – GM Chito, GM Monnie and GM Eddie Velez, GM Bobby Taboada, GM Nilo Servila, GM Nick Elizar, GM Dr. Ben Marapao, GM Fred Buot, Jr., GM Eddie dela Cruz, GM Nene Gaabucayan, GM Winnie dela Rosa and GM Romy dela Rosa, GM Bobby Tabimina, and the surviving sons of Villisan, namely GM Ver, GM Bianor, GM Joey and GM John Villasin. Vintage footage of Venancio "Anciong" Bacon training with his students in Fort San Pedro.